Stability under the cover of autocracy is not only unjust and brutal but also unsustainable. 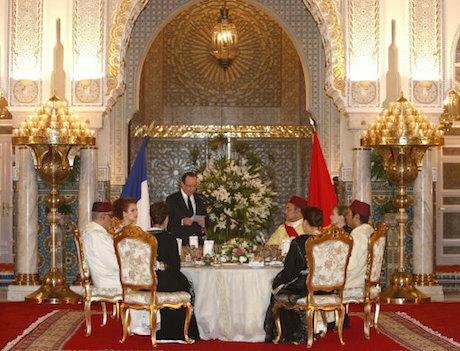 Hollande delivers a speech at state dinner hosted by the King. Abdeljalil Bounhar/Press Association Images. All rights reserved.While the Arab uprisings led to regime change, and civil war, the monarchy in Morocco managed to contain its protests through reforms, which were largely applauded by international leaders. On July 6, 2011 Catherine Ashton expressed a widely supported perception among European governments and referred to the constitutional reform as “a significant response to the legitimate aspirations of the Moroccan people.” However the reform did not make Morocco more democratic or hold the regime more accountable. Inspired by the Arab uprisings in Tunisia and Egypt, the so-called 20 February Movement was able to unite diverse groups of Moroccan society and mobilise the largest demonstrations in at least a decade. The heterogeneous groups and individuals were first and foremost united by their criticism of the kingdom’s autocratic practices. The response by the palace was remarkably fast and effective. Within weeks of King Mohammed VI’s seminal speech on March 9, the protest movement’s ability to rally large demonstrations and keep the pressure on for political change faded. The king appointed an advisory commission for the revision of the constitution. This process did not involve representative institutions; no elected body – such as a constituent assembly – was established, nor was the parliament consulted. However in addition to the selected advisory commission, a political commission was established, in which the largest eight parties of parliament were represented. Abdellatif Menouni, a close advisor to the king, headed the advisory commission, which allowed the palace to keep control of the process as well as the outcome at all times. Reflecting the crown’s preference for a “participatory approach”, the advisory commission used a consultative mechanism based on hearings. However, some crucial organisations criticised its credibility due to its composition and the lack of transparency of the process. The country’s most important labour union, three leftist parties (Parti Annahj Addimocrati, Parti socialiste unifié and the Avenue de la résistance), the islamist movement Al-‘Adl wa-l-Iḥsān and the independent Moroccan human rights organisation (AMDH) boycotted this process. Likewise, the 20 February Movement did not participate in the hearings. The debate on the final text of the constitution was limited to the advisory commission. Neither parliament nor the media, or any other organisation, participated in a public debate on the final articles of the constitution. The discourse surrounding the new constitution was limited in scope and depth, not only because of the opaque nature of the reform process, but also due to the lack of information available to the media and public. The new constitution introduced a number of changes, most cosmetic in nature. The king, for example, is no longer described as “sacred”, but the integrity of his person remains inviolable. However, his role as commander of the faithful, thus ability to influence politics through his religious function, remains unchallenged. Morocco’s prime minister now has to be selected from the largest party in parliament by the king. Despite this, the constitution also preserves an opaque dual cabinet structure: one headed by the prime minster, who leads the government and a second, presided over by the king, called the council of ministers. Manifold control mechanisms and veto rights reinforce a non-transparent executive decision-making system in which the monarch ultimately holds power. As such, the new constitution did not redistribute power in the kingdom. Formally democratic institutions such as the government, the parliament and political parties remain junior partners in a dual governing structure dominated by the palace. No effective control over the power of the palace has been established. In the aftermath of the constitutional referendum and subsequent elections in November 2011, the political landscape was stabilized and essentially returned to similar authoritarian conditions that existed prior to the protests. Although the palace has preserved its control over the political sphere, future mobilizations can by no means be ruled out. The current calm may well be shortlived. Recent protests against the rise of energy prices, a higher education reform and the crackdown on activists and journalists indicate prevailing grievances. Given the nature and the outcome of the reform process, unilateral applause by European leaders was misguided. An assessment of the constitutional reform process should translate into a more focused foreign policy towards the kingdom. Stability under the cover of autocracy is not only unjust and brutal but also unsustainable. European policymakers should not assume that fundamental shifts in Morocco’s political system will lead to instability and give rise to extremism. Why should a more comprehensive shift towards a parliamentary monarchy undermine stability? As the Arab uprisings have proven, the notorious regimes across the Arab world provide only superficial stability. Meaningful democratization and inclusive political processes and institutions that can address the grievances of the disenfranchised young populations are the only way of providing long-term stability. This holds true for the entire region. Given the flaws in the new constitution, the EU’s narrative of the Moroccan role model has to be revised. European governments and EU officials should engage in a more critical dialogue with their Moroccan counterparts. Economic cooperation could be conditional upon meeting democratic standards, beyond mere lip service. The withdrawal of established economic privileges and access to the European market should be openly discussed among European member states. Existing institutions, such as parliament, political parties, civil society organizations and the judiciary, that hold the highest potential in creating a change within the existing political system, should be the main focus of intergovernmental cooperation. Political parties, labor unions and NGOs should be supported through capacity building and exchange. Meaningful support in democratic transitions will make the EU’s foreign policy not only more credible throughout the region, but could also contribute to more stability in Morocco.